Class Photos 1975 - Brighton technical school, Victoria, Australia. Front row - Jenny Edington, Christine Greig, Linda Solomon, Sandy Young. Brighton Technical School, Berwick Street, Brighton, Victoria. Photograph taken outside the 'New Science Block', 1975. 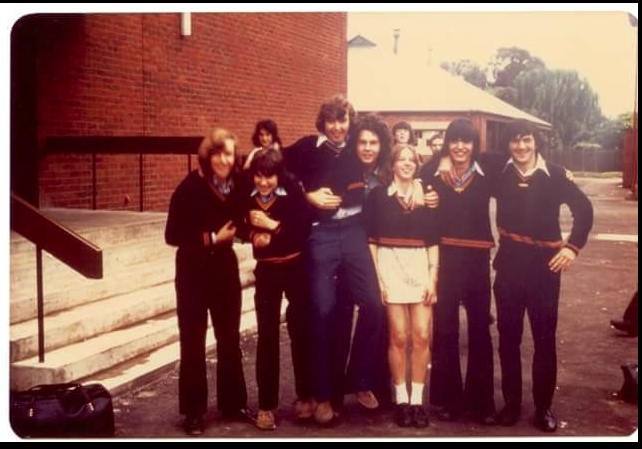 At the front of the photograph, left to right : Bryan Hellyer, Ross, Peter Donald, Phil Pearmain, Kathy Zucker (nee Campbell), Phillip Burns and Mark Kraus.